Don’t let the pink fool you – this little girl’s colorful personality is sweetly sassy! 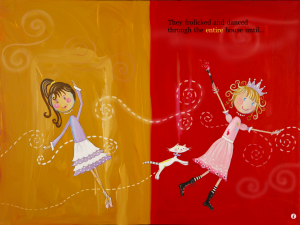 The features on this storybook app make it an easy read for any age. My 2-year-old daughter is going through an uncharacteristic “girly” stage right now. If it’s pink or sparkly or has flowers on it, she wants it. She just recently got very upset with me because I had the nerve to try to get her to wear her brother’s old (navy blue) sweatshirt. She informed me – in a way that only a small child can get away with – that she wasn’t going to wear it any more and promptly picked out a pink jacket as an alternative. 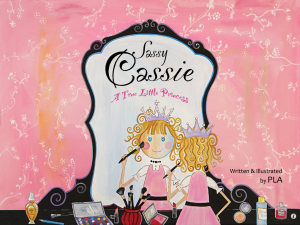 Sassy Cassie HD tells a similar story about a strong-minded little girl who just wants to express herself and her bold personality.What began as a Kickstarter effort has come to fruition be evolving into and interactive reading and art experience for early readers. Nacny Pla Schneider is the artist behind the whimsical original artwork that was created first on canvases using acrylic paint. The characters are depicted in soft brushstrokes and a decidedly feminine color palette. 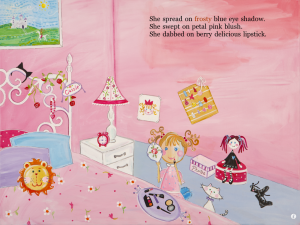 The story is simple but every little girl who has gotten into the makeup drawer can relate to Cassie. While the story is being read the individual words are highlighted to help little readers further understand word and letter recognition and phonics. I won’t spoil anything for you Cassie does some sneaking, some back-talking, and some painting. Ultimately all she wants in the end is to be able to express herself like her artist mother or her photographer father. After the storyline is through, players get a mini-lesson in color theory – in a way that young players can really understand. The last feature is a quiz about both art and the characters in the book. Generally speaking the app itself is very well executed in that it’s uncomplicated and uncluttered, which makes a world of difference when a child is using the iPad. The voice of the narration, however, is very monotone and doesn’t express the emotions in the book, such as Mom’s frustration and Cassie’s sassy words. Also, while the story is easy to follow, 3- to 6-year-olds will need some help with the reading required to complete the lesson and the quiz. Overall this is a fun and colorful app to add to your collection of interactive storybooks. The artwork alone is worth the $2.99 download price, and it’s not very often that I’ve seen an easy-to-follow directive on color mixing for little ones. Sassy Cassie HD is now a solid third on my daughter’s list of favorite things EVER, elbowing out the latest Barbie movie – and that’s no small feat.